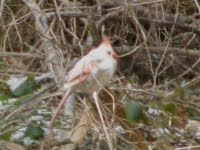 I have been meaning to mention something I found on Andrew's blog (Burdr) the other day...a new bird! 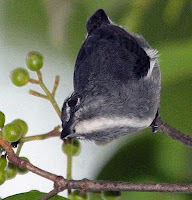 Yes, last month an article was published in BirdingAsia, the Oriental Bird Club's journal, that detailed the discovery of a new species of bird scientists call the Spectacled Flowerpecker. Flowerpeckers have been seen and named before, but this is a new one that spends it's time high above the forest floor at the Danum Valley Conservation Area located in Sabah, Malaysia. The only reason it was found is because of conservation methods and tourism efforts that has lead to birdwatching walkways high in the canopy of the trees. Do go read his full article and find more pictures of this facinating find at Andrew's blog here. Wow...a new bird in 2010! The Great Backyard Bird Count is an annual, four-day event that engages bird watchers of all ages in counting birds to create a real-time snapshot of where the birds are across the continent. 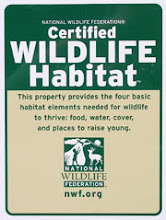 Anyone can participate, from beginning bird watchers to experts. 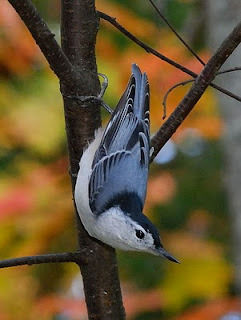 These images, all from Wikipedia, are examples of birds I have in my backyard right now. 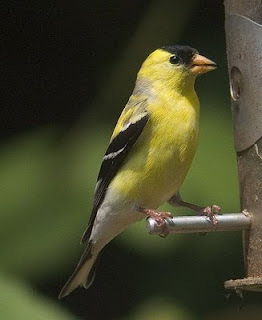 They are pretty common birds almost anybody would have at their feeders. What's in your yard? The Great Backyard Bird Count is put on by the Cornell Lab of Ornithology, Audubon, and Bird Studies Canada, with sponsorship fromWild Birds Unlimited. After uploading your sightings you can even stay on the site and see other counts pour in across the US and Canada. It’s lots of fun and keeps ya off the streets! Cornell has put up a whole bunch of helpful information to help the new birder. Click here to check it out! There is also a whole bunch of information on Google, here. Have fun! Here is another cool site I just found for beginning birders. 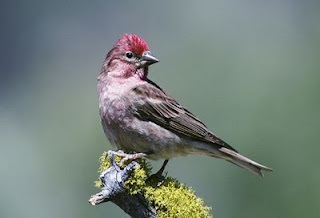 This site has four nice videos on how to 'see' birds: "Size & Shape", "Color Pattern", "Behavior" and "Habitat"...all excellent clues experienced birders use when watching birds. Do check them out! 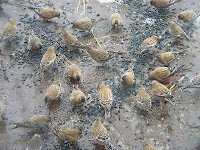 I wish I could adequately capture an image of the numbers of Rosy-Finches that visit my yard. It's got to be well past 200 now, and they visit every single time it snows. The other day, we got less than an inch of snow, but the Rosies came. Sure, they only stayed a couple hours in the morning...but they showed; like clockwork. I have read that during breeding season these birds develop a special 'pocket' where they can store extra food. In the high places of the tundra where they breed, they must search far and wide; going great distances, to and fro, looking for food. But apparently those pockets are not 'year 'round' attributes. Still, it seems they may come a distance as they seldom arrive all that early here...perhaps an hour after daylight. 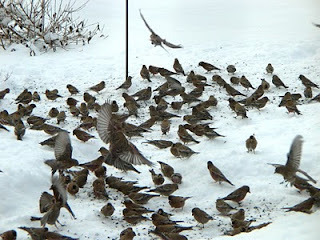 And they don't stay nearly as long as the Juncos, who will feed till nearly dark. I have also read that, because of their limited exposure to people on their breeding grounds, they are fairly comfortable with people in close proximity. 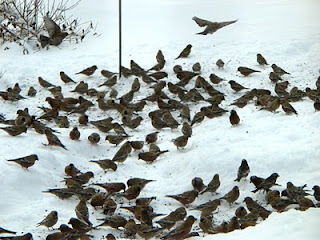 I've noticed that while I'm tossing seed or re-filling feeders, they will land within a step or two of where I'm standing. 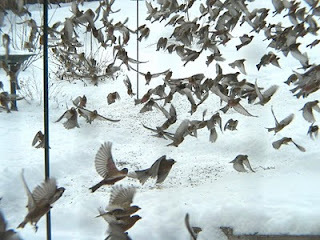 If I quit moving, they will land by the hundreds; feeding right in front of me. It is the most astounding sound when they all take off at once. I wonder where they go at night. 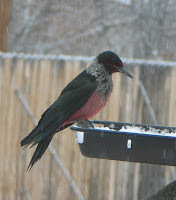 I don't seem to have discouraged the Lewis's Woodpecker who has been visiting for a month or so now. While he doesn't seem to be trying to boss everybody around as much as he was...he still shows up every day. Perhaps part of the reason is that (for awhile) I quit putting out kibble for the Magpies. 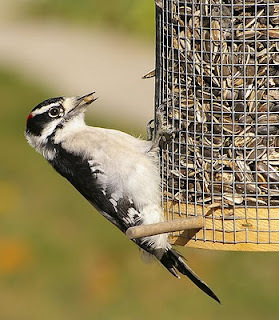 In spite of occasionally seeing the woodpecker at the suet cage, I continued to offer the 'fat-worms' I cut from lengths of meat trimmings and peanuts in the shell because he seems to ignore those and quit visiting that particular feeder. 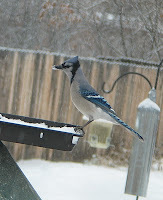 I'm happy to say, the number of Blue Jays in my yard has increased. My friend Dave called this morning to ask "It's snowing, are the Rosies there?" Of course they were, so he dropped by. I warned him that, like many birds, these guys show up for a couple hours and then disappear; sometimes to return a but later. Not only did they cooperate by the hundreds, but so did the Lewis's, the Sharpy and a single American Robin. Dave lives outside of town and a bit higher than I do and has Robins by the hundreds and regularly hosts Steller's and Scrub Jays...but he doesn't often get Blue Jays. The guys who hang around my feeders these days were a real treat for him. In addition to the Rosies, 30 or more Evening Grosbeaks, a couple Cassin's Finches, one or two Song Sparrows, and a Sharp-shinned Hawk that buzzes through every now and then. Oh...and with all the 'regulars' is that single White-winged Dove. I mentioned how odd I find it that when the Rosies are here...the Evening Grosbeaks are not. 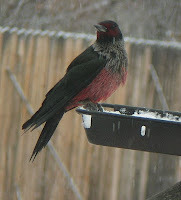 True to form, we didn't see the Grosbeaks while the pink-butts were in the yard. 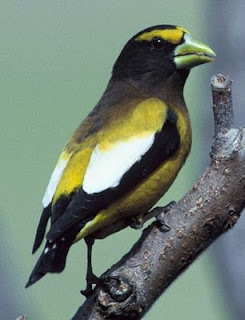 However, now that the Rosies have moved away...the Evening Grosbeaks are back. Odd, and unfortunate too. 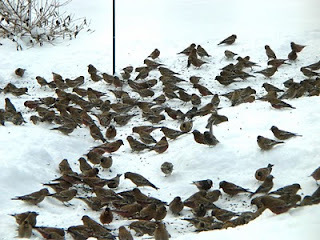 While 200 Rosy-Finches can wheel in and out of my yard, sometimes feeding just a few feet from the windows, and they've never hit a window. 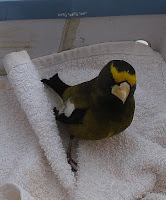 However, the Evening Grosbeaks just don't seem able to avoid window-strikes from time to time. In spite of the bird netting that keeps most others from hitting the window, every season takes one or two of the Grosbeaks...and today was the day. The Sharp-shinned Hawk made a pass just now, scattering birds as he flew through. 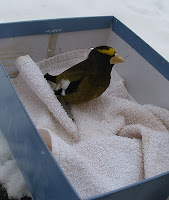 Unfortunately now, an Evening Grosbeak recuperates (hopefully) in a box. I've done this before; put cotton-toweling on the floor of the box and set the shocky-bird on top; quickly closing the lid. box the second time. I do hope that is not a broken beak! 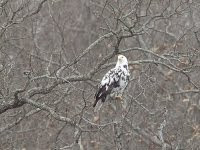 of things, including this leucistic Bald Eagle. Do click the photo for more information on just what it is 'leucistic' and to see another shot of this stunning bird. Donald, a birder/biologist who teaches kids and who also blogs, shows us a leucistic bird he found. His Cardinal is not very clear...but it sure is sharp. Click his photo here to get to his website and find what he's up to.